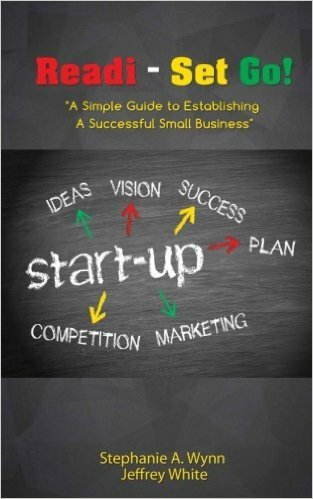 There are many good guides for starting a small business, but first-time authors Stephanie A. Wynn and Jeffrey White have created a concise roadmap that stands head and shoulders above others in the genre. 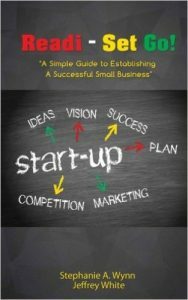 The pair begin this book very logically with reasons why you — as a small business start-up — should pay attention to the overwhelming odds that you’ll fail. Ninety percent do, they say, primarily due to poor planning. They go on to give concrete — and very easy-to-follow — directions on how you can avoid the perils and pitfalls awaiting business newbies. In short, if you follow the succinct advice laid out so well in this book, you’ll emerge victorious as one of the ten percent who celebrate their fifth year of business in the black. Early on, Wynn and writing partner White stress the need for a concise, but well-thought-out, business plan, coupled with what they call a “Vision Board” to help you see clearly where you’re going — short-term and long-term. Without this vital visionary tool, you’re liable to wander far away from your original business objectives. Other standout sections in this handy guide include a brief table that easily lets you decide your company’s legal status, and advice on creating your company’s “brand” — that key differentiating feature or benefit that makes your business, product, or service stand out among all others. Rounding out this vital section is a checklist and twenty detailed, fill-in-the-blank questions to keep you on track and out of the proverbial ditch when starting out. Next, Wynn and White lay out the importance of assembling the right team to ensure your success — both internal and external — that is, employees or business partners versus outsourced options, such as CPAs or Web designers – to give your online presence just the right glow of professionalism. Next comes a rich resource list of folks who can be invaluable in helping reach your goals — from the highly acclaimed Small Business Development Centers scattered in cities across the country, to the National Association of Women Business Owners — a vital support group specifically dedicated to your success, if you’re a woman entrepreneur. Rounding out the book’s invaluable advice is a discussion on the vital importance of professionalism, even in the face of rude or uncooperative clients or customers, and the key role played by a vigilant attention to first impressions. “By changing the perception of your business, you can demand a higher price for your services and people will pay accordingly,” the authors assert. And, finally, there’s a special focus on an aspect of business success too often overlooked by entrepreneurs — the notion of making adequate provisions for life after retirement. The authors outline such key elements of a retirement plan as a possible Simplified Employee Pension (SEP) for you and those working with (and for) you and investment options you might use to grow your money over time. Five-plus stars to this outstanding little primer on how to succeed in business. In fact, if you only buy one book on making your small business successful this year, Readi- Set Go should be it.